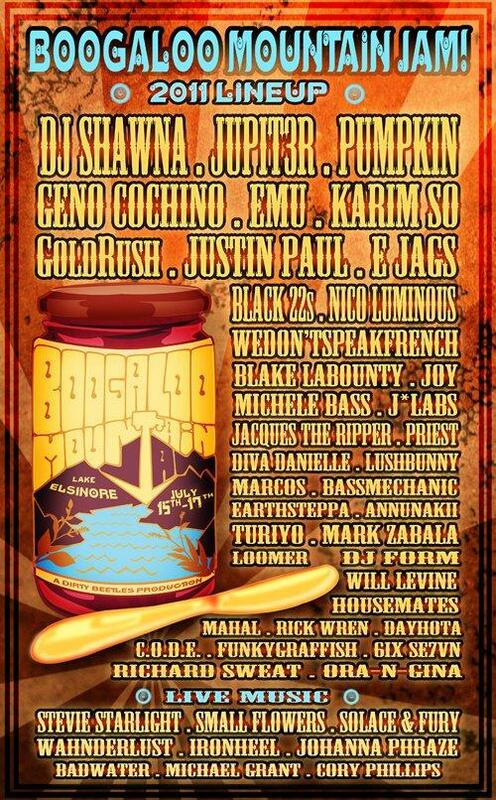 Three days and two nights of fantabulous mountaintop wonder, set against an awesizzling, breathsmacking panoramic backdrop of the Lake Elsinore basin. Tent camping space will be provided on the JamGrounds. Parking on site. Bring your own bevvy's or hit up one of two stageside bars. Go splashwild in the stagefront pool or pick up change to a dozen dirty beats in the shaded hillside ampitheater. hike out to ring the vibegong down at buttcrack rock, watch hang-gliders soar out over the cliffdrop, or kick it pillowstyle in one of three plush and cozy busslounges including BOOGALOO himself. knock out some yoga goodness in a morning yoga class and then bushwhack your way to that damn secret waterfall everyone's been talking about. This is the weekend minifest your tarot cards have been telling you about. Listen to the universe. Come out to Boogaloo's Mountain Jam and get a little sticky.